Chinese peony flowers originated in China over 100,000 years ago. Chinese peonies grow well in USDA hardiness zones 3 to 8. Plant the roots a few inches deep in good draining soil in full sun. Peonies like afternoon shade in warm climates. Some Chinese peony varieties are staked with a peony ring or tomato cage to keep them from flopping over. Ants are commonly found on the flower buds eating the nectar. The ants do not cause the plant any harm, but do not plant the peonies near the door or the ants will come indoors. Chinese peony flowers (Paeonia lactiflora) grow 3 feet tall and spread 3 feet wide. This upright flower grows elliptical-shaped leaflets. The flowers are red, pink, white or a combination of these colors. The blossoms measure 3 to 6 inches across and fill the early summer air with fragrance. Each bloom lasts 5 to 10 days. Chinese peonies are grown in flower borders, hedges and cut flower gardens. Chinese peonies do not blossom if planted in excess shade, given too much fertilizer, planted too deep, exposed to late spring frosts or competing with other plants for nutrients. This type of plant does not like to be dug up and can survive in an area for 50 years. Fernleaf peonies (Paeonia tenuifolia) are a type of Chinese peony growing 15 to 20 inches tall. The delicate leaves of this variety are finely divided and look like a fern. The flowers are dark red with a single row of petals. The exception is the Plena cultivar, which has a double flower. Fernleaf peonies are difficult to propagate and are more expensive than regular peony plants. Plant the fernleaf peonies 1 1/2 to 2 inches deep. Deep planting will retard the blooming of the peony plants. Deadhead fading flowers to encourage flower production and keep the soil moist throughout the summer. Tree peonies (Paeonia suffruticosa) are Chinese peonies that grow 3 to 5 feet tall as an upright shrub. The woody stem is topped with the leafy peony stems. The 6- to 8-inch blossoms are red, white or yellow. One tree peony plant produces 75 to 100 flowers in two months. This variety was developed over 1,600 years ago. Tree peonies do not die back to the ground in the winter like other peonies, but they drop their leaves in the fall like a deciduous shrub. 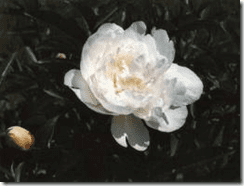 Protect your tree peony from the sun in the afternoon to keep the blossoms on the plant longer. Do not cut your tree peony back. They are grafted onto a shrub and the peony part will not grow back. The best planting site is one with protection from the wind.